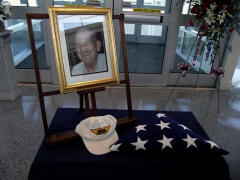 The General Aviation Terminal (GAT) at the Raleigh-Durham International Airport could barely contain the number of those attending the Celebration of the Life of a man who left his mark on so many people. Maj. Salvatore Tripoli (1928-2010) “…slipped the surly bonds of earth” on December 31, 2010 following a brief illness. Maj. Tripoli graduated from the Florida Military Academy and served in the U.S. Air Force during the “Korean Conflict” from 1948 to1952. He received his Bachelor of Science in aerodynamic engineering from the University of Utah. After a brief career with Douglas Aircraft, Sal migrated to IBM and a 30 year career where he implemented control systems for the Apollo Moon Landing, automated control systems for the FAA, developed the Safeguard Missile defense system and the Integrated Radio Room for the Trident submarine. One of his proudest accomplishments was planning the interface between mainframe computers and terminals that eventually became the PC. When he retired, Sal finally had the opportunity to pursue his first love, flying. He had been in flying clubs since 1963, owned his first of many airplanes in 1966, and earned instructor ratings in instrument, commercial, and multi-engine aircraft. He instructed, flew for corporations, ferried airplanes, flew lighted signs—anything to stay in the air. In 1963 Sal joined the Civil Air Patrol and served in Texas and Virginia—finally finding a home in North Carolina. As a member of the NC Wing staff he filled the positions of Director of Operations, Chief Check Pilot and most recently—Director of Safety. Sal supervised the integration of two new Cessna 182s equipped with the G1000 “glass cockpit.” During Sal’s service as Director of Operations, the NC Wing was in the top 10 for aircraft utilization. But Sal’s true devotion belonged to the Raleigh-Wake Composite Squadron where he demonstrated his love for flying to senior members and cadets. Adding to his Commander’s Commendations and Meritorious Service Award, Sal was named Senior Squadron Member of the Year in 2005. The service honoring the life of Sal Tripoli began with seating of his family (wife Nancy, daughter Vallyre, son-in-law Ken and granddaughters Alexandria and Marina), and the posting of the colors by the NC Wing Honor Guard. Just outside of the GAT, on the General Aviation Ramp two aircraft were parked: a red, white and blue CAP Cessna 182, often flown by Maj. Tripoli, and a tan and red Ercoupe, his pride and joy. Chaplain (Capt.) Laura Johnson opened the ceremony followed by the NC Wing Chaplain (Lt. Col.) David Bobbey. Squadron Commander, Lt. Col. David Crawford offered the eulogy, which recalled his many experiences flying with Sal. Maj. Dion Viventi, Maj. Craig Winkleman both of Raleigh-Wake, and Lt. Col. Jason Altieri, US Army (and CAP) expressed their gratitude for the privilege of having worked and shared an aircraft cockpit with Maj. Tripoli. A contingent of members from the NC Wing Staff attended the ceremony, led by wing commander, Col. Roy Douglass. Buglers Cadet Jordan (Burlington Composite Squadron) and Cadet Morton (Cunningham Field Composite Squadron) played a flawless rendition of Taps. Trooper Brandon Johnson, NC State Highway Patrol, played Amazing Grace on the bagpipes. Representatives from the US Air Force from Seymour-Johnson AFB presented a folded American flag to Mrs. Tripoli in honor of SSgt Sal Tripoli, USAF’s service to the nation. As those attending stood during the final notes, tear-streaked cheeks of the many fellow pilots, family and friends gave mute testimony to the legacy given to us by this heart-warming soul. As one of the speakers attested during the evening, “Sal Tripoli was more than a pilot…he was an aviator.” There can be no higher compliment. Additional photos are found on Lt Col Crawford's Facebook page.